Jackpot Strike Mobile Casino Review -- Deposit £20, Play with £100! Jackpot Strike offers mobile slots, casino games and awesome promotions! Nektan produces some pretty awesome casinos. 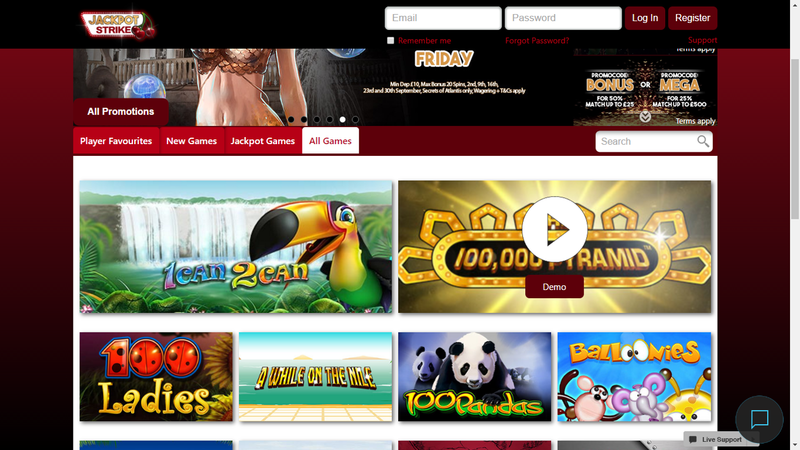 Just by looking at the homepage of Jackpot Strike, players who love Nektan casinos will feel a warm sense of familiarity. This is because all Nektan powered mobile casinos tend to be layered the same way (just compare this casino to GoWin and see what we mean). However, that isn't to same the two websites are the same — far from it. The may have similar games but the promotional content present at Jackpot Strike is slightly different. We think the question should be: why not Jackpot Strike? It has everything you could want from a casino and more. 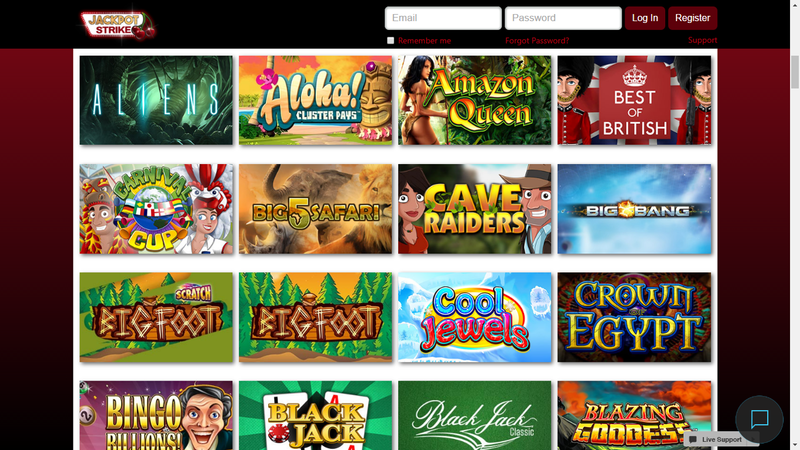 Awesome NetEnt games can be found among its ranks including every installment of the NetEnt Rock Slot Trilogy (Jimi Hendrix, Guns ‘N Roses, and Motörhead). This in addition to all the great Nektan trademark titles. The promotions are a great accompaniment to these games with promotions to mark the beginning of the week and the end. We will go into more detail below but it's good to know that they make your time here worthwhile. The design of the website is your typical Nektan layout so there's little that's new there, however the colour scheme is bold and replicates the whole ‘casino atmosphere' that we sometimes talk about. There are several jackpots you can play at Jackpot Strike, including the brand new Wolf Run, an exciting jackpot slot that offers up a jackpot of over £800,000! If that isn't a reason to sign up with Jackpot Strike then we don't know what is. As we've mentioned, the games portfolio for Jackpot Strike is impressive. 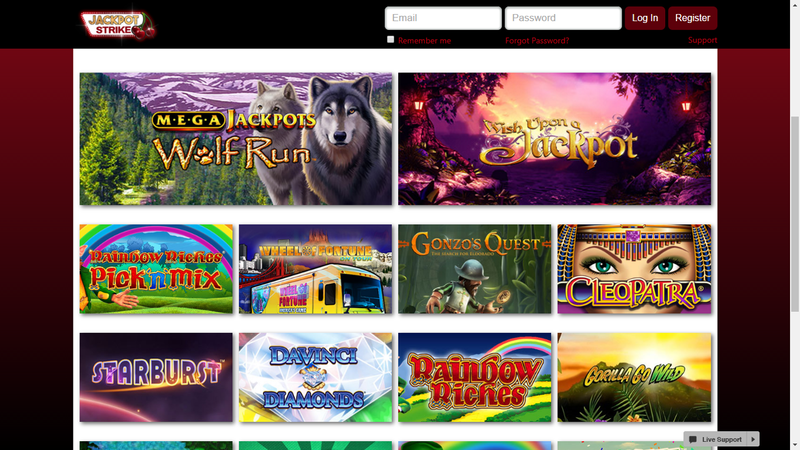 Largely consisting of slots as the name suggests (though there are a few table games thrown in), the majority of these games are extremely fun and colourful experiences. They operate well both on mobile and desktop, too, so you're not missing out if you favour one device over the other. Although you can play them on desktop, we highly suggest playing Jackpot Strike games on mobile as it is a truly thrilling experience. The performance is both smooth and professional and requires little effort from your phone in order to function. All you need is a strong 3G connection. Among the game selection, you'll find games such as Starburst, Gonzo's Quest, and many more. Like we said, there are plenty of bonuses and promotions to go alongside the awesome gaming library here at Jackpot Strike casino. You'll notice immediately logging onto the site that they offer a deposit match of up to £80 if the new player deposits £20. This means you'll have up to £100 to play with! This is a great deal as it allows players to get a good start on playing the majority of the slots available on the website. There are some weekly promotions at Jackpot Strike including a £250 deposit match which happens every Monday, ensuring players a topped up and ready to go every week. Players can also choose their own bonus with the MEGA and BONUS promotion that allows them to earn either a 50% match of up to £25 or a 25% match of up to £500. Top the week off with 20 extra spins for NetEnt's Secrets of Atlantis. Unfortunately, to say that Jackpot Strike has a lot of promotions going for it would be a stretch. Though the promotions it does have are accommodating for almost every new player, it does have very few of them. It would be interesting to see what other promotions they bring out in future. This section will be surprisingly short as jackpot Strike mobile casino has a very easy-to-follow depositing and withdrawing system in place. So you will not have to trawl through the terms and conditions to find out exactly what's required. You can deposit in many ways, them being: Visa Debit/Credit transaction, Neteller, Skrill, and Boku pay-by-phone billing service. We strongly recommend Boku as it is the easiest and most accessible way of paying for your deposit. All it requires is your phone number and an SMS message. From their you can choose to take the deposit from your phone credit balance or add it to your monthly bill. You must make a minimum withdrawal and deposit of £10 in order to successfully make use of your money. Any lower will not be accepted. Customer service at Jackpot Strike is pretty solid. With a Live Chat support, you can enter your phone number and visitors name to get to ask any question you may have. The answers will be prompt if not instantaneous. However, there is an FAQ page for the majority of inquiries you could possibly have with the running of the website. It's a comprehensive list of questions and serves as a competent guide if you're a little bit scared of approaching the site runners for help. There are more direct ways of contacting them. You can telephone them at (+44)2036217014 or email them at [email protected] This should be saved for more difficult questions which cannot be found in the FAQ or easily answered by the Live Chat function. Want to play at Jackpot Strike? Jackpot Strike is modern, sleek and easy to use with awesome games and bonuses! Claim £80 deposit bonus now! Summary Overall, Jackpot Strike is a great casino and demonstrates once again the unbroken formula of Nektan-powered casinos. It has great games, great promos and excellent access to banking methods. The site is well-designed and provides sturdy customer support. Any issues you may have with the site would be resolved in a jiffy. We are a little disappointed, however, with the lack of promotions available. While the ones that are there are pretty good and provide a solid foundation for the player's week of gambling, there aren't enough for everybody. On the other hand, the ones that are there are still pretty good and make up for this lack of promotion fault. A very competent casino all-around, Jackpot Strike may just prove to be one of our new favourite Nektan casinos.